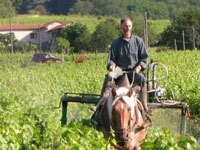 Home Blog What Is Biodynamic Wine? Biodynamic wine is organic wine, although it is often referred to as 'more than organic'. Biodynamic vineyards have the same goal as organic vineyards — to produce grapes from which to make wine profitably without using synthetic additives. The only difference between organic and biodynamic vineyards is that on biodynamic ones the work in the vineyard is timed to coincide with the earth’s natural rhythms so that the vine is receptive to what the winegrower is asking it to do. These natural rhythms are determined by the position of the sun, the moon and the planets as well as the earth. So whereas organic growers spend most of their time preoccupied with what is beneath their feet — the soil — biodynamic growers are as preoccupied with what is going on above their heads. They ask you to think of what a vine looks like in winter after it has just been pruned (the vine has to be pruned to produce a crop).The vine is a bare stump; by summer it is thick and bushy with considerable shoot growth and leaves upon it, as well as the emerging grapes. Only 10 per cent of the bushy growth and the grape bunches created by the vine between the winter pruning and summer is provided by the roots drawing matter (i.e.mineral elements) up from the soil. The other 90 per cent is created by the atmosphere — think of sun-light, without which photosynthesis would not occur. An example of working with natural earth rhythms is the timing of planting. A vineyard plot maybe planted once only every 100 years, so biodynamists feel that choosing the right day on which to plant is critical if a vine plot is to remain productive and healthy for those 100 years, and not need to be ripped up and replaced after just 15 or 20 years; or sprayed constantly because the vines are weak. This is why biodynamists plant near the new moon, when the earth’s gravitational rhythms are downwards — the direction the baby vine’s roots must first go if it is subsequently to survive and prosper and then grow up towards the sun. New moon days are sometimes called ‘root’ days, because that is when this part of the plant is ‘working’ or favored. By combining the downward movement of the vine root with the downward gravitational pull exerted by the new moon on the earth, a biodynamic grower hopes to give all his baby vines and their roots the best possible start in life. The vine will grow quickly and strongly — and will be less susceptible to disease for its 100-year lifespan — and that saves an awful lot of potential spraying. Many people think biodynamics is all hocus pocus, because growers are constrained to do certain tasks in the vineyard only on certain days, when the planetary influences are right. However no one seems to think organic growers are crazy because they plant new vines in spring, harvest their grapes in autumn and prune the vines in winter. The organic (and conventional) farming calendars are broadly divided into four seasons per year; the biodynamic calendar is precisely divided into 365 days per year. Vine treatments — which are sprayed on the leaves, usually in the form of homeopathic, plant-based biodynamic teas — are timed for ‘leaf days', when the passage of the moon through certain constellations is such as to make the leaves receptive; harvesting of the grapes is timed for ‘fruit days' to capture or pick the grapes at the moment they are in harmony with natural forces, and so on. Biodynamics is sometimes as imperfect as organic when the ideology meets practical reality. Biodynamic vineyards are supposed to be as self-sufficient as possible — which means, for example, that all the compost must be made on site, rather than bought in. The idea is that each vineyard becomes an individual, unique place – the opposite of the conventional approach where all the vineyards in a village may buy the same brand of fertiliser, the same brands of sprays, and the same brand of yeast from a single supplier. Many biodynamic vineyards have gone further to create this ‘individuality’— for example by getting rid of their tractors and re-adopting horse-drawn ploughs, so as to have a source of natural manure to build the compost piles. They can usually obtain compost from a neighboring farmer or rancher, but delivering the dung in a truck that burns fossils fuels and goes against the biodynamic idea of the vineyard as a self-sustaining entity. Vineyards claiming to make wine biodynamically are certified by a regulatory body called Demeter and bear the Demeter seal which is an international trademark.